Love the beach? We’ve got a yoga for you. Like to sweat? Try yoga in a 105-degree humid hothouse. Yoga for women, yoga for gents. Surf’s down? Time for yoga on a paddleboard. The ancient art of yoga has become a popular practice. It was the late 19th century when yoga originally came to the West, later becoming popular in the 1980s when fitness classes of every kind were all the rage. Proven as a natural aid for a number of stressors from anxiety to arthritis, yoga is most commonly enjoyed to improve one’s physical, mental, and spiritual well-being. Dwaileebe does not charge for the beach classes, although donations are accepted. Also, as an instructor at Coronado Fitness Club, Dwaileebe teaches “Man on a Mat,” a yoga class exclusively for men that is focused on fitness movements, muscle strength and mental focus. The men meet on Tuesday nights at 7. Dwaileebe also teaches chair yoga every Friday at the Coronado Senior Center, a class where participants strike poses while seated. The popular class of two dozen or more attendees is Dwaileebe’s favorite. “The people are just so fun,” she said. Linda and Jean Pierre Marques, owners of Coronado Yoga and Wellness Center, came to Coronado 13 years ago following an 11-year career at the world-renowned Canyon Ranch in Tucson, Ariz. Linda was Fitness Director, responsible for 60 instructors and 400 weekly classes, and Jean Pierre founded and was Director of the Spiritual Awareness Department. While at Canyon Ranch, Jean Pierre almost single-handedly started a spiritual revolution in the spa world. Clients from all over the world came to his classes, including entertainers from television and motion pictures, Julia Roberts and Robin Williams among them. Linda Marques remembers the ranch with fondness. “Our time at Canyon Ranch was extraordinary, working with all kinds of people from all over the world.” Along with the wealth of experience she and Jean Pierre garnered from their ranch tenure, Linda says they have made it a priority to instill the Canyon Ranch spirit — one that embraces the whole person, mind, body and spirit — at Coronado Yoga and Wellness Center. Jean Pierre continues to teach martial arts at the studio when he is not traveling with private clients. He was recently inducted into the USA Martial Arts Hall of Fame as a Grand Master. “We want to teach our students to take the peaceful place they are in class and bring it with them into their everyday,” he said. Yoga class packages range from $9 to $12 an hour. Another advocate for yoga as a means to heal, Cynthia Mendolia has been a yoga instructor since 2010 at Sharp Coronado Hospital. Sharp Coronado is an affiliate of Planetree, a coalition of more than 100 hospitals worldwide that encourage healing not only through medical therapy but also through mental, emotional, spiritual and physical therapies. Gentle yoga is offered twice a week on Mondays and Wednesdays at 4 p.m. in the Studio at the new Sewall Healthy Living Center on the hospital’s third floor. (Complimentary valet parking is offered outside the lobby entrance.) Many of Mendolia’s clients are 60 years and older and a number have had hip and knee replacements, so she emphasizes flexibility in her training. Once a month at the Studio, Mendolia’s classes include a harpist. “Music can really help you relax,” she said. The 50-minute classes are $8 for Coronado residents. New to Coronado, Karlie Knight is feeling the heat at Coronado Hot Yoga, a new yoga studio at 1222 First St. that features the practice of Bikram yoga, developed by Bikram Choudhury, an Indian yoga teacher. Bikram yoga is practiced in a room heated to 105 degrees with 40 to 60 percent relative humidity. Over the course of 90 minutes, students perform a series of 26 postures, the same set every time, all of which improve strength, endurance and balance. The heat, said Knight, allows the body to warm up quickly, so that one can stretch safely and deeper. “And the heat keeps your heart rate up and sweating allows you to detox. So you’re really giving yourself a nice deep clean from the inside out,” Knight explained. Knight pursued teacher training in 2009, and by 2010 she had opened her own Bikram studio, leaving her job as a real estate broker for good in 2011. Though the business was successful, Knight and husband Brooke Knight always loved San Diego and longed for the sunshine. “Our son was getting older and we wanted a great school for him. Coronado has that and more,” she said. Knight opened Coronado Hot Yoga in April of this year after selling her studio in Portland to her General Manager. Strictly Bikram, the classes are consistent with the unchanging postures of every class. The introductory offer includes one week of unlimited classes for $30. “I’m overwhelmed at how much I love it here already,” said Knight. In 1986, Brad Willis, then a newsman with NBC, was on vacation in the Bahamas when a storm arose. While battening down the hatches, Willis was thrown from an upper level perch and landed flat on his back. Though the pain was intense, he resisted surgery that he believed would effectively end his career as a Middle East war correspondent. Seven years later, he collapsed in the Philippines and was forced to return to Coronado where his doctor noted that his once mild fracture was now a major break. Surgery failed. Next came a diagnosis of Stage IV throat cancer in 1998 and Willis’s life devolved into a spiral of self-medication of alcohol and drugs. When his family held an intervention and his son, Morgan, one day urged him to “Get up, Daddy!” Willis took it to heart, and began a journey toward health. Now, Willis, aka Bhava Ram, meaning “living from the heart,” is the founder of Deep Yoga at Ginseng Yoga Studio in South Park with his wife Laura Plumb. He recently authored “Warrior Pose: How Yoga (Literally) Saved My Life,” which documents his journey of healing through yoga and Ayurveda, an ancient system of holistic medicine. “I want people to know they can heal themselves.” Willis said of his motivation for publishing his memoir. Serenity Yoga classes are $10 for Coronado residents. Ginseng Yoga offers an introductory package for 10 days of unlimited classes at $20. For those interested in finding core strength through yoga, welcome to yoga on a . Brody Welte brought PaddleFit to the Coronado Boathouse and Clubroom last year and teaches a paddle-board yoga class, combining stand-up paddling with yoga postures that challenge the core as balancing on the water becomes priority. At $35 per class, it has become a popular way to get in a fun workout. “You’re out on the water enjoying yourself, all the while challenging your coordination,” Welte said. 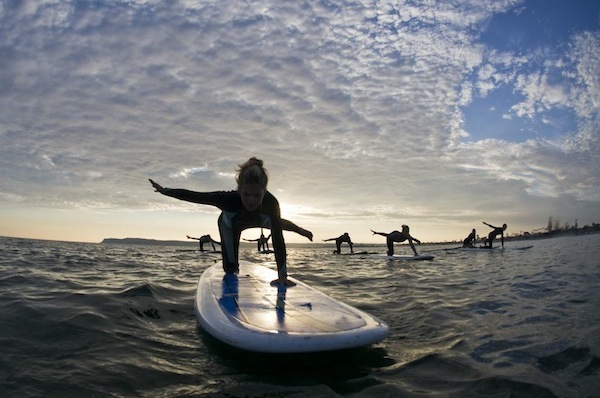 Vickie Carson’s nonprofit SUP Coronado also teaches yoga classes on paddle boards off Coronado’s Central Beach. There is no charge, but donations are accepted. “You’re out on the water enjoying yourself, all the while challenging your coordination,” said. Carson. Ethyanne Ochoa at the Gym in Coronado has been teaching Power Yoga since the gym opened in 2012. The class emphasizes strength training as poses are held for longer periods of time, building total body muscle as a result. Recently Ochoa has acquired trapeze fabrics of bright beautiful colors for her recent addition of Aerial Yoga classes. Additional Gym in Coronado yoga classes include gentle yoga, integrated yoga, Iyengar yoga and Core-Nado Pilates. As the material hangs from the ceiling, the student is able to attain a deeper stretch by being partially or fully supported by the hammock. “It’s an eye opener when you try it, just realizing how inflexible you are but how much more flexible you soon become,” said Ochoa. Drop-in classes at the Gym are $15.